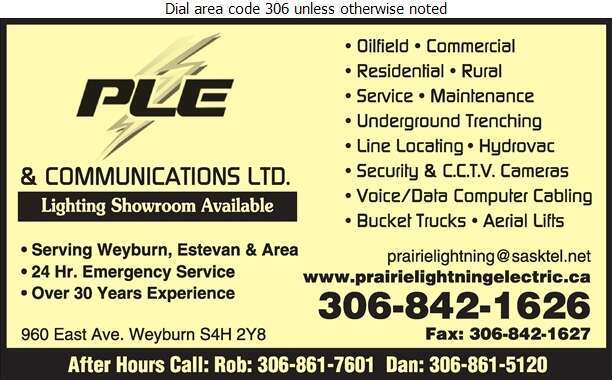 Serving Weyburn, Estevan and area, Prairie Lightning Electric is a locally owned and operated business. With over 30 years of experience, our professional electricians provide commercial, residential and industrial electrical installation, maintenance and repair. Furthermore, our team specializes in high tech electronic services including: line locating, the installation of security cameras, C.C.T. V. cameras, and voice and data computer cabling. As a multi-service organization we also provide high quality hydrovac services with our 50 gallon towable hydrovac truck. At Prairie Lightning Electric, our commitment to safety is our top priority. Our fully trained and licensed electricians are ready to respond to your needs. We offer a 24 hour emergency service.